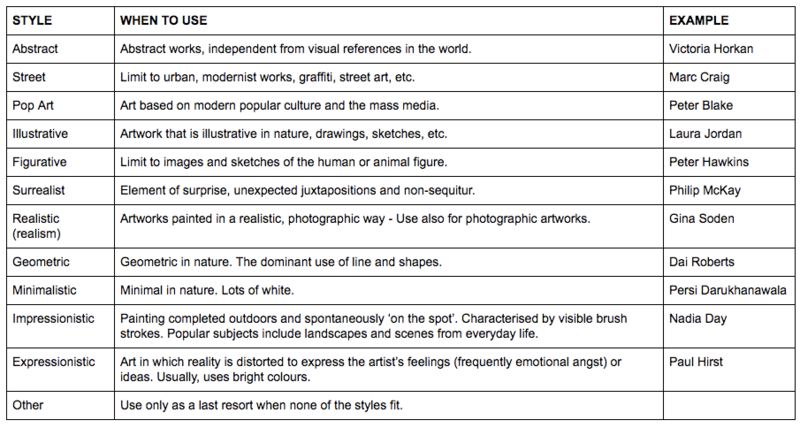 When submitting your artwork on Rise Art, you’ll be asked to choose categories that best represent your artwork. 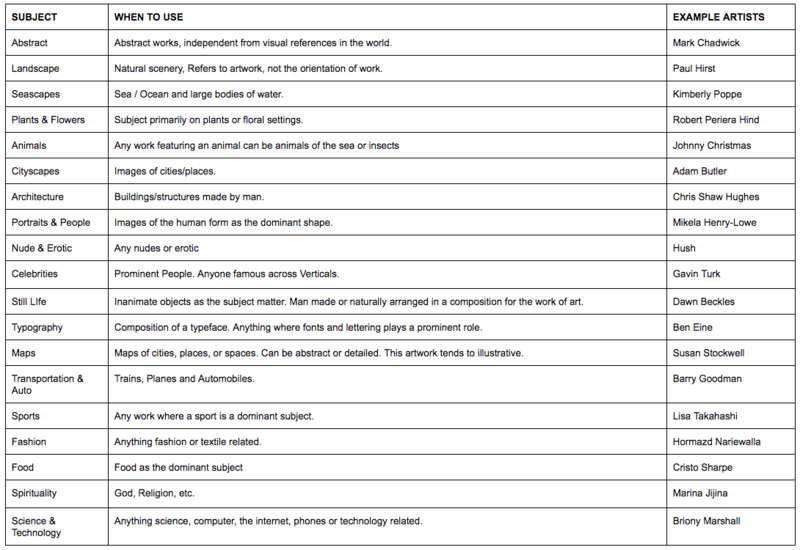 To improve the visibility of your artwork on the site, here are the best ways to classify your work into the different categories. Medium refers to the materials that an artist has used to create his/her artwork and you should select the medium that is most appropriate for your work. E.g. if your painting is made with oil paint please choose Oil Painting - instead of just Painting (Painting → Oil Painting). 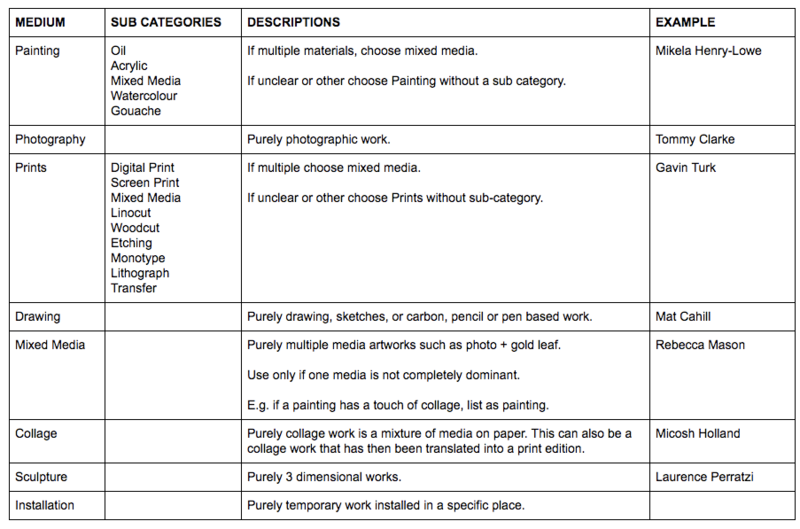 If the materials you’ve used to create your painting or print in the sub category are not available, just choose Painting or Print. What is style? It’s the manner of expression that an artist or artistic movement belongs to. Pick the style that best fits your work and think about it from the customer’s perspective. E.g. if you’re labelling an illustration that has a few figurative elements, choose the dominant style. Would someone be drawn to this piece because it’s an illustration or because it’s figurative? What is featured in your artwork? Choose the dominant and most relevant subject. E.g. a sporting scene in front of a landscape belongs in the filter subject Sport rather than Landscape because a sport is the focus of the work. Tags are keywords related to your artwork that will make it show up when customers are searching for art across the site. Tag your artwork with 5-10 descriptive tags. Think about the strongest elements of your work and feature them in the tag section if they don’t fit in under any other filters e.g. Have you used gold leaf? Is your work a London cityscape? Choose tags that don’t repeat the medium, subject and style categories above. Choose descriptive tags specific to your artwork. How to submit your profile for a chance to sell with Rise Art?